The new VR 10-30mm f/3.5-5.6 PD-Zoom will come supplied with the Nikon V3 kit, or separately for SRP $299, whilst the VR 70-300mm f/4.5-5.6 will be available for SRP $999. Updated from the old 10-30mm f/3.5-5.6 Nikon 1 kit lens, the new VR 10-30mm f/3.5-5.6 PD-Zoom version boasts two new features, Vibration Reduction (VR) and a Power Drive Zoom (PD-Zoom). The PD-Zoom adds similar functionality to a compact camera lens, so it retracts automatically when the camera is turned off, and offers a built-in lens cover, so doesn’t require a lens cap. What’s more, unlike a standard interchangeable zoom lens, the PD-Zoom offers an electronic zoom control system, which may feel a little unusual at first, but the lens still features a zoom ring on the barrel for familiar operation. The addition of Nikon’s 4-stop VR system is a bonus for shooting relatively static subjects and zoomed out should enable shake free shots with shutter speeds as slow as a ½ second. Weighing just 85g it’s a lightweight option too, and with a minimum focus distance of just 20cm it’s a good solution for close-up photography on the Nikon 1 system. 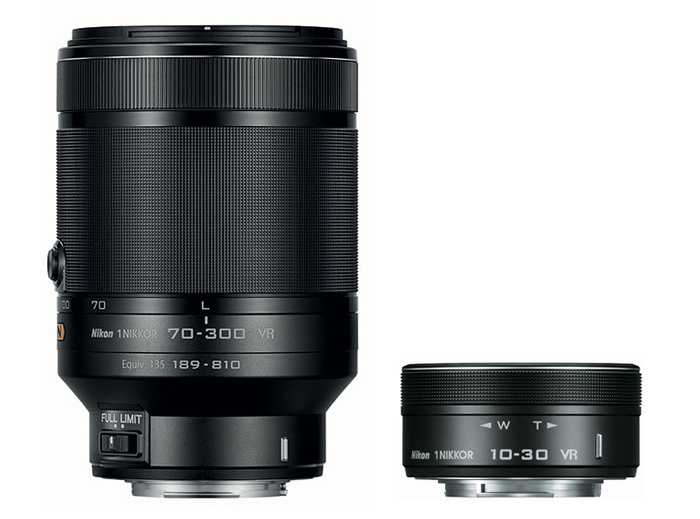 The new VR 70-300mm f/4.5-5.6 becomes the longest Nikon 1 telephoto lens available by some distance, offering almost 3 times the reach of the existing VR 30-110mm f/3.8-5.6. With a staggering equivalent focal length of 189-810mm it’ll catch the eye of sports and wildlife enthusiast who don’t want to be lugging around huge chunks of glass. That said the ‘slow’ max f/5.6 aperture when zoomed in means you’re going to need pretty good light to get the shutter speeds required for action photography. The 4-stop VR system will help for shooting more static subjects however, and at the max focal length, shutter speeds of around 1/60th sec should be possible without images suffering camera shake. There’s also a Focus Limit switch, to stop the focus hunting too much when you’re fully zoomed in, a TR-N100 tripod mount available separately for attaching the lens to a tripod or monopod, and finally Nano Crystal coatings and Super ED glass elements to reduce flare and chromatic aberration.